What an Honor to be Chosen! Apple just kicked off their new World Gallery campaign. The World Gallery campaign spans across 70 cities in 24 countries. This geographical scale makes it the largest mobile photography gallery ever assembled. iPhone photographers will be posted on various Apple channels, including but not limited to, outdoor billboards, print publications, Apple.com and/or the App Store. 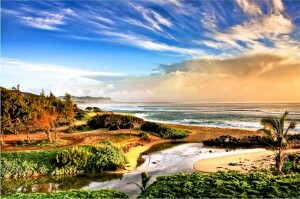 Lumahai Beach is a popular and picturesque beach. This long stretch of white sand beach was made famous by Hollywood when Mitzi Gaynor spent her time on this beach washing that man right out of her hair, in the movie South Pacific. The beach is easy to reach by following a short trail down to the beach. I normally do not go to this beach for sunset pictures. The surf was rockin’ earlier in the day so I thought it might be a good place for a change at sunset. I like to take lots of pictures at sunset because you never know what each sunset has in store. I started taking panoramic pictures with the iPhone as the sun set. This is a difficult time for any camera because of the difference between light and dark. We all know what happens when a subject is backlit~ everything else in the picture is very dark. I really am impressed on the ease and clarity that the new iPhone has taking panoramic pictures adjusting for the light in very difficult lighting conditions. I am very honored that Apple chose one of my Kauai pictures because Kauai is a very special place for Steph and I. My Kauai Flickr photos have been viewed over 1.3 million times. Please do me a favor and repost to all your media sites. I would like to get as many likes as I can! My Kauai picture is now now on 19 billboards around the world! Romance comes alive with sunshine and beautiful scenery, as indicated by the winners of our 10Best Readers Choice contest for Best Anniversary Destination. Readers of 10Best and USA TODAY cast their votes over a four-week period and the results are in. Congratulations to all our winners! We have a suspicion that the planning half of many couples will tuck this list away for future reference . . . and they should. Thanks, too, to our Expert Panel, which included Carley Roney, cofounder of TheKnot.com. Here’s to romance! Access: Turn off Highway 56 onto Maalo Road. Wailua Falls is at the end of Maalo Road. You can literally drive right up to Wailua Falls—or at least the top of the waterfall. A nearby lookout offers a terrific view of the 80-foot plunge waterfall, which fans of the 1970’s series Fantasy Island might recognize from the opening credits. The waterfall is especially impressive when heavy rains fill the Wailua River, sending voluminous fast-moving water over the entire span of the fall’s lip. 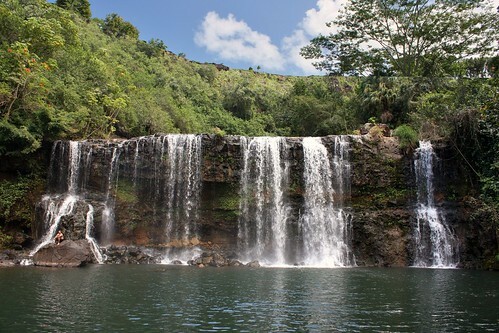 Century’s ago, native Hawaiian men would leap from the edge of the falls into the pool below to prove their manhood. We wouldn’t recommend that activity, or hiking the slippery makeshift trail to the bottom of the waterfall, where the above picture was taken. 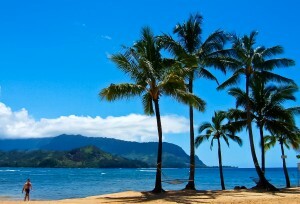 Forbes recently posted an article highlighting the top 7 reasons why Kauai is the best of the Hawaiian islands. Some of which include our amazing cuisine, spectacular water sports and the innumerable wild animals to view while swimming or hiking. Be sure to read the whole article to see the many other reasons why Kauai should definitely be your next stop when traveling. Click to read the Forbes article. Kauai in the movies again! Finally some good waterfall news. Tonight I was watching the movie Just Go With It with Jennifer Aniston and Adam Sandler. Much of the movie is set in Hawaii. At the 1 hour mark the actors want to go swimming in a waterfall. 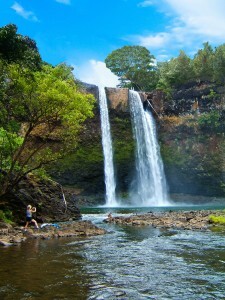 Can you recognize the Kauai Waterfall? It is definitely one of my favorites…Kilauea Waterfalls.